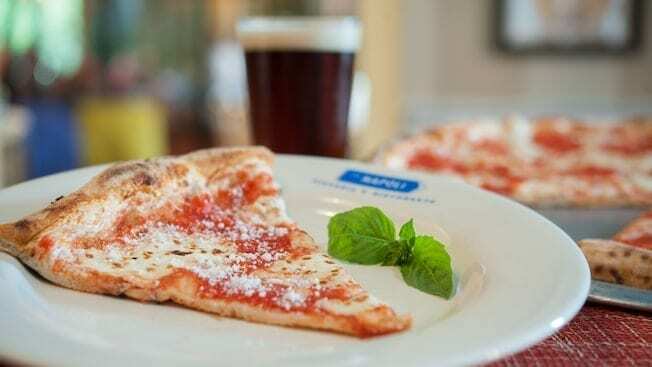 8 – The pizza is authentic Neapolitan pizza. The pizzas are authentic from Naples, the home of the very first pizza. The restaurateur for the restaurant, Nick Valenti, studied the process for making the best pizzas by studying the dough, crust, necessary cooking temps, sauces, cheeses, etc. right from Naples. Then he used this information and training to develop the menu and recipes that is served at Via Napoli Ristorante e Pizzeria. You know you are getting authentic and quality pizzas from this restaurant. It is as close to Italy as you can get without actually traveling there. 7 – There are other menu items besides pizza. If pizza isn’t your thing, then have no fear. You aren’t stuck only eating pizza. There are other menu items like Lasagne, Spaghetti and various other Italian pasta and meat dishes. These are fantastic and also cooked with traditional Italian flavors, ingredients and cooking methods. The location is definitely worth a visit, even if you don’t plan to order a pizza while you are there. You won’t be sorry! 6 – The location is fantastic. Italy is centrally located in the World Showcase, right between the American Adventure pavilion and the Germany pavilion. There is a boat dock from Future World in Germany, so you can cut off a lot of the walk time if you are heading over there after a long day of walking around. If you plan to have dinner at the location and then watch Illuminations, you should be able to snag great viewing areas of the show right after dinner when you exit the restaurant. 5 – Pay close attention to the ovens. While you are dining in the restaurant, you will notice the large wood-burning ovens. 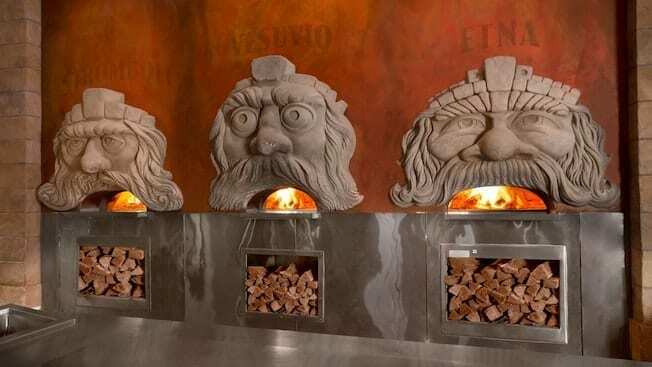 They are shaped like faces with the pizzas being inserted into the mouths of the faces that appear on the wall. The pizzas are perfectly cooked over the wood-burning fires, as opposed to the electric ovens that many of us are used to. This is extremely unique, plus is one of the key things that make the pizzas as amazing as they are. 4 – You must save room for dessert. The desserts at Via Napoli are absolutely amazing. You will find classic Italian favorites like Tiramisu and Gelato, along with a few other delicious desserts. The Zeppole di Caterina is one of my favorites. It is a cheese fritter-like item that has ricotta cheese for the filling. It is served with whipped cream and chocolate on top of it. It is decadent and delicious. I don’t think you could go wrong with any of the desserts, so you have to make sure you save room so that you don’t miss out on these sweet treats. 3 – Get to know your server. The servers are locations in the World Showcase are actually native to each particular country. 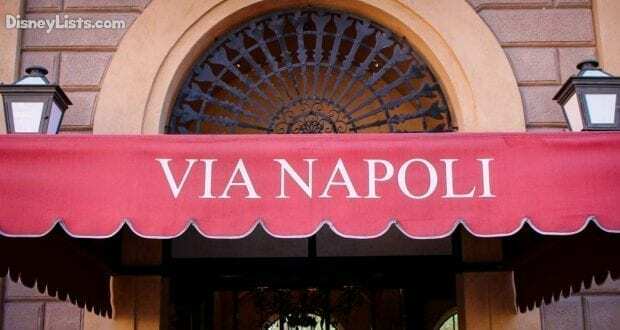 At Via Napoli, your servers will actually be from Italy. They will be able to speak Italian and have a lot of great information. Spend time talking to your server to learn more about where they are from and what additional stories and information they may be able to share. You could learn something and make your meal more interesting. We have always had amazing service, and it appears that is definitely part of the Italian culture. 2 – The prices are very reasonable. When you consider that you can order a pizza that serves 3-5 people for only $41, it is pretty reasonable, especially for table service dining prices at Walt Disney World. Typically an entrée for one person would cost at least $15, so this is a great way to dine on a budget with the family and still have a completely delicious meal and unique experience at the same time. 1 – The restaurant is still completely friendly for guests with dietary needs. If you have special dietary needs, then you don’t have to worry. The restaurant can accommodate just about every dietary allergy, including gluten allergies. The chef will come out and personally discuss items on the menu that will meet your needs, as well as items that may not be on the menu that the chef can whip up based on your own likes/dislikes so that you know you will receive a meal that will be tasty and satisfying.